This Dump-and-Bake Hash Brown Breakfast Casserole is an easy brunch recipe that's ready for the oven with just 5 minutes of prep! In a large bowl, whisk or stir together shredded cheese, 1/2 cup of the melted butter, sour cream, pepper and condensed soup. Fold in the thawed shredded potatoes. Transfer potato mixture to the prepared baking dish. Next, prepare the topping for the casserole by combining the crushed Corn Flakes with the remaining 2 tablespoons of melted butter in a small bowl until the cereal is coated. Sprinkle on top of the potato mixture in the baking dish. Bake, uncovered, for 40-45 minutes (or until heated through and topping is browned). Cooking for a Smaller Family? Cut the ingredients in half and bake in an 8-inch square baking dish. Can Hash Brown Casserole be Made the Night Before? Yes! Assemble the dish in advance and keep it covered in your refrigerator overnight. Allow it to come to room temperature in the morning, and then bake according to the instructions below. 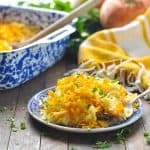 Can Hash Brown Casserole be frozen? Yes! You can safely freeze this hash brown breakfast casserole before baking. Thaw in the refrigerator overnight before baking. Alternatively, you can freeze the casserole after baking as well! Allow a baked casserole to come to room temperature before wrapping tightly and freezing for up to 3 months. To reheat leftovers or to reheat a previously baked (and then frozen) hash brown casserole, bake in oven at 350 degrees for approximately 30 minutes, or until heated through. If you would like to prevent further browning on top, simply place a loose cover of foil over top of the casserole while it's reheating in the oven.